Many homes are now being built with at least one room having a walk-in closet. These specific types of closets are specifically built for the storage of clothing and shoes. They are wider, have more space, and of course, allow you to walk into them easily, hence the name of the closet. When designing your walk-in closet, it should both be ideal as well as attractive. Determine the size of the closet. A walk-in closet should be able to accommodate someone being able to walk into it without being cramped. If you can, make sure the closet has a window so that natural light comes in from the outside. The closet needs to match the rest of the bedroom, so make sure that everything matches with respect to the bedroom it is in. Make sure you have a place to store shoes. Items such as shoe racks can be purchased and placed on the floor under most shelves for your shoes. 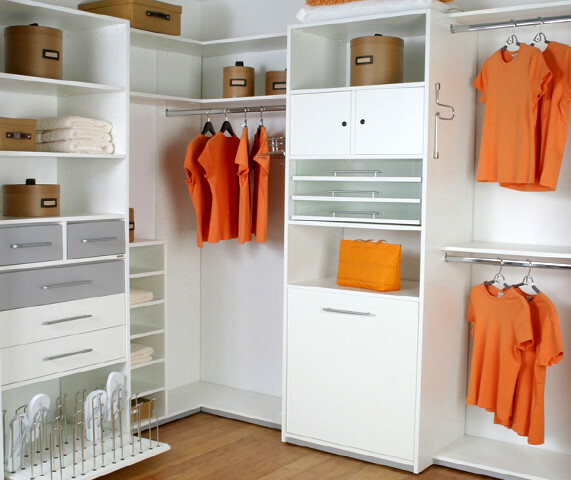 If you are living with someone else and sharing the same closet, you will need to divide it into a his and her space. Make sure that it is designed with gender needs in mind. An example could be a tie rack for a man and a lingerie drawer for a woman. Make sure to purchase and use a closet organizer. A closet organizer is a series of shelves that is set up against the wall, giving the closet more storage spaces. Make sure the shelves are made of either thick metal or hard wood or that there are different kinds of shelves for many types of clothing and accessories. Finally, add the finishing touches to your walk-in closet. If you can, add a place to sit while someone tries on their clothes. A mirror is also an important necessity as well as a nice rug or carpet if you don't already have carpet in your home.